If you sit on the deck of the River House in Brielle, or drive over the Rt. 35 Veterans of All Wars Memorial Bridge into Point Pleasant, you might see some heavy construction equipment working out on Gull Island. I saw some of this activity recently and wanted to know what was going on so I started doing some research. 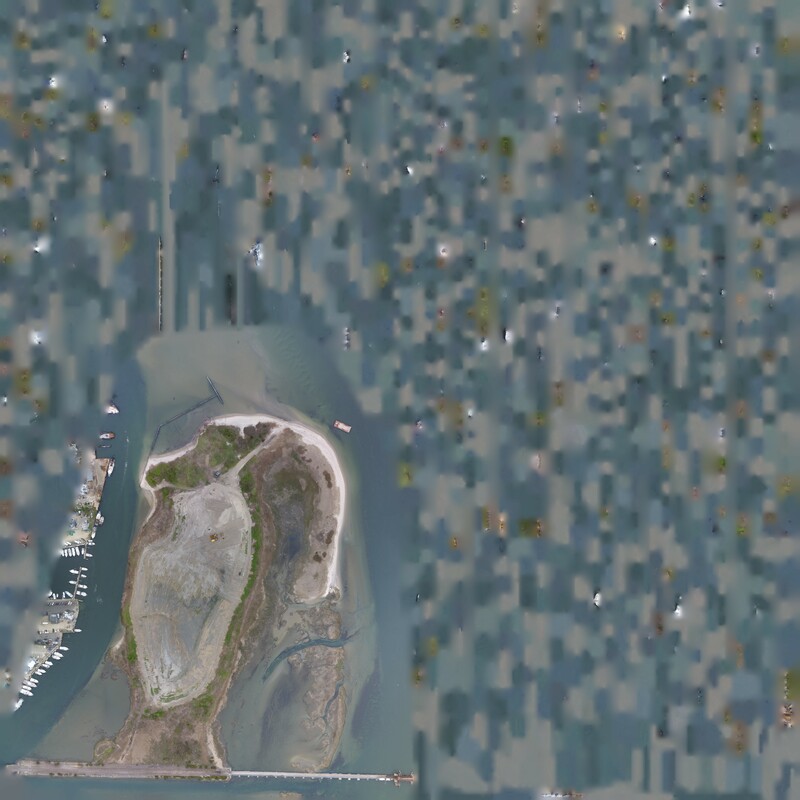 I also took the drone out to map Gull Island to get an aerial perspective. If you turn on the Elevation layer in the map above, it is immediately apparent that work is being done to build up walls around the center of the island, and that are established paths from the center down to the beach level. 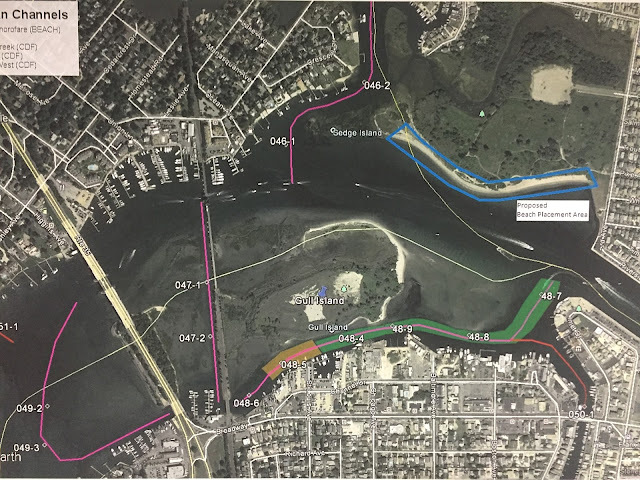 A project was bid last fall that includes portions of the Lower Manasquan, Wills Hole, Wills Hole West, Kings Bridge and Crabtown Creek. Construction of the CDF situated between Wills Hole Thoroughfare and the Manasquan River proper is currently on-going. We expect dredging will begin the end of the summer. We hope July but might be August. The project is expected to move roughly 90-100,000 cubic yards of material. Most of which will wind up in the CDF with the safe and usable sand going to Manasquan for use on the beach. Confined disposal facilities (CDFs) are one of the most widely used technologies for managing contaminated sediments.... A CDF is an engineered structure designed to provide the required storage volume for dredged material and to meet the required suspended solids in effluent released from the facility. The NJ DOT also has some interesting resources on CDFs on their website. There are lots of proposed uses for this material, from topsoil to construction to the sand inside the yellow garbage can looking highway crash barriers. Having just recently watched the documentary Sand Wars, I'm kind of partial to leaving any sand that isn't fit for the beach here locally and NOT exporting it for construction or other uses. 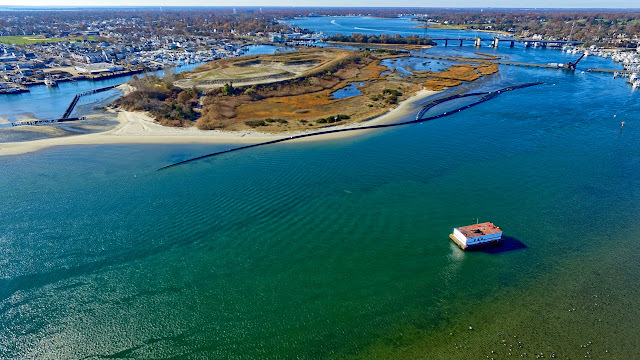 So it would appear that as the dredging occurs, material that is not suitable for beach replenishment on Manasquan beach will be transported to the Gull Island CDF. 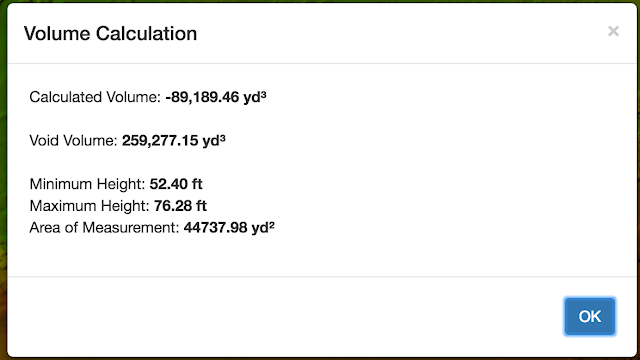 One of the nice features of Maps Made Easy is that once you have a map created, you can measure volume against the elevation model. I created a polygon around the center of the wall and calculated the volume of the void of the CDF. 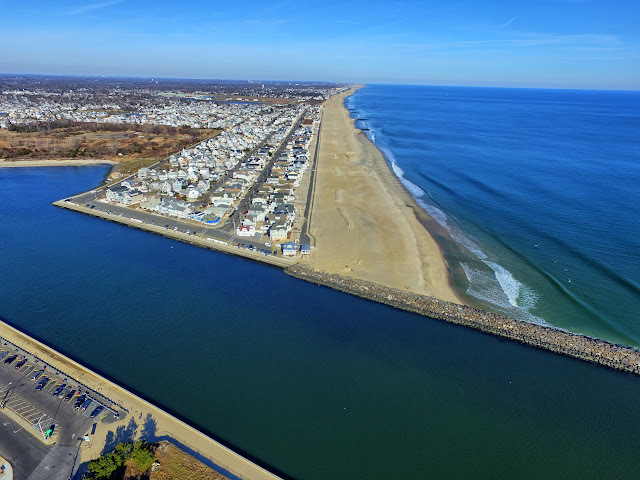 Currently, the CDF can hold around 89,000 cubic yards of material, which is right in the ballpark for the figures (90,000-100,000 cubic yards) disclosed by the DOT, assuming some percentage of the material will be of high enough quality to pump onto the beach in Manasquan. 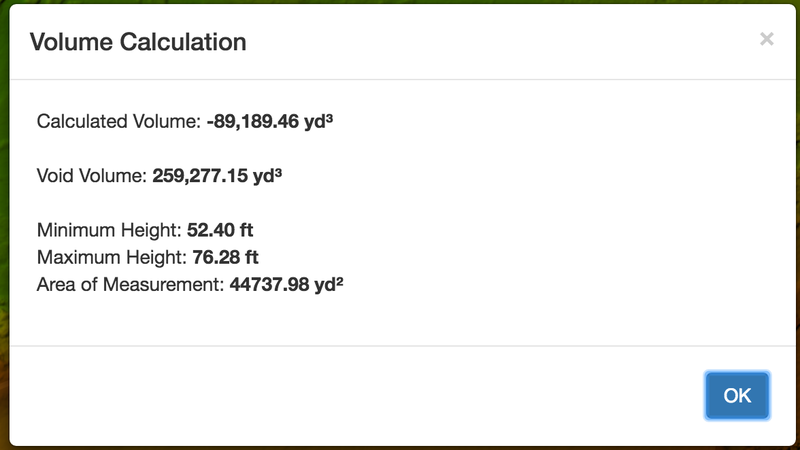 I'll continue to fly missions over the CDF and try to document the project as much as possible and should be able to monitor the volume of material deposited in the CDF over time. 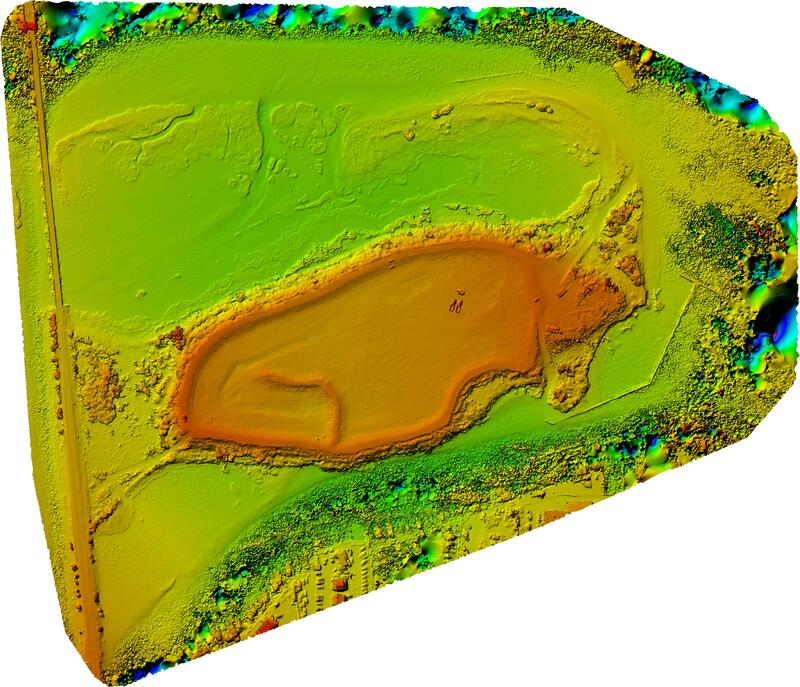 Thank you to MapsMadeEasy.com for the environmental credit grant which enabled this processing.